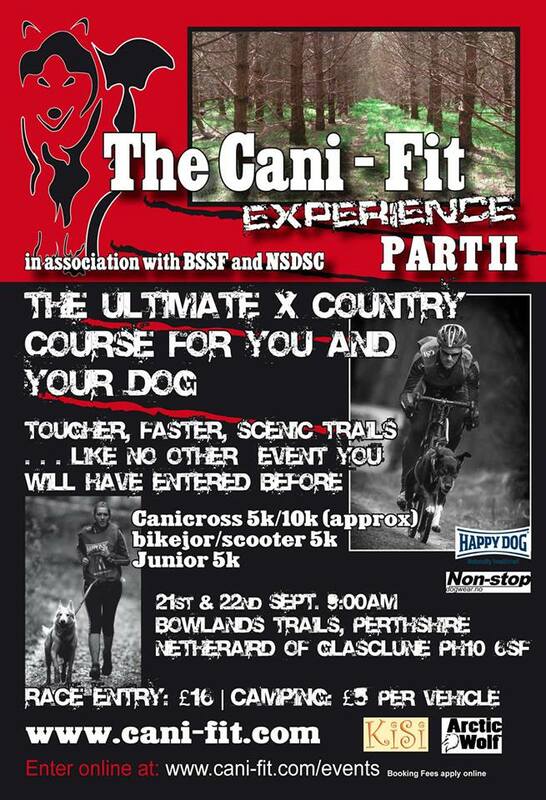 The NSDSC are pleased to be working Cani-Fit to be hosting The Cani-Fit eXperience II, which will be the very first BSSF (British Sleddog Sport Federation) accredited event to be held in the UK . Canicross Races: Dogs must be over 12 months to compete, canicross allows 1 dog per team. Bikejor Races Male and Female combined race: Over 18 runners only and dogs must be over 18 months to compete. Bikejor allows 1 dog per team. Dog Scooter Male and Female combined race: Over 18 runners only and dogs must be over 18 months to compete. Scooter allows 1-2 dogs per team. These sports are all dog powered sports, and whether your dog runs by your side, or pulls way out in front they should be in a comfortable fitting harness and attached to the runner. The equipment will be scrutinised upon registration. Only in exceptional cases will we allow a dog to canicross in a collar. Dogs must be proven to not pull at all and be able to comfortably run at humans pace. All dogs in bikejor and scooter class must be in appropriate equipment. Please check that all your equipment is in full working order before racing. Please note dogs can only enter one class per day, humans can enter 2 classes per day. e.g canicross and bikejor, canicross and scooter or bikejor and scooter, using different dogs for each. Junior under 10 years must have an adult with them during race. Camping available Fri and Sat night on course at £5 per vechile per night.